London Union, the parent company of Street Feast, has opened an outdoor event space at Hawker House, available for corporate hire. The venue in Canada Water in London has introduced The Land of Bamboo to its offering, bringing its total capacity to 3,500. The venue can accommodate large-scale conferences, outdoor teambuilding events and summer parties, and is available to hire from May to September. The space, which takes over the outdoor area of Hawker House, has been designed as a ‘tropical tiki paradise’, filled with sand pits, trampolines, tiki huts and a fire pit. 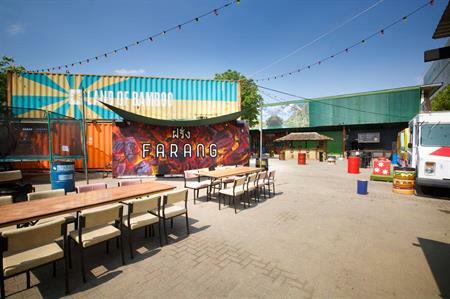 Alongside this, six street food traders have been added, including Japanese katsu from Yu Kyu, meat-free Mexican tacos from Club Mexicana, American ribs and brisket from Smokestak and whisky chicken from Thai barbecue, Farang. Emma Howe, sales director at London Union, said: "The Land of Bamboo is like nothing the UK event industry has ever seen. It’s a fantastic outdoor space with the added extra of having vast indoor space available. Whatever the weather, Hawker House and the Land of Bamboo are a great choice for event bookers."